This was my 5th country visit other than India. One of the Bhramanti Member Sandesh Sawant has been studying in Denmark and he was there to complete his internship in one of the Nova group company at Copenhagen. For me it was dual intention one is to meet him as well tour the Copenhagen City along with him. He too was on his holiday after completion of his internship. Denmark is famous for the Fine Art/ Architetural work. The country itself is small as comapre with India, one can say its like Gujrath state of India. Its in the north of Germany, totally covered with Sea. Morning of 28th Aug, I took a flight from frankfurt to copenhagen by Lufthansa. 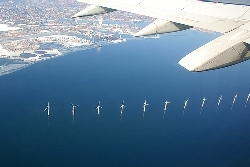 It was very scenic view I got from the plane before landing, specially the Windmills in the middle of the sea. It took 1 hr. 15 min to land. I was browsing through the duty free shop to find the wine and regreted due to fact that I didn't baught it in Frankfurt itself as a token. Anyway I dropped that Idea and thought of consolidating the same in some other way. Sandesh was waiting for me on the exit gate. It was exactly one year when he landed in Copenhagen Airport coincidently. The airport exit is not time consuming as compare to my previous experiences like Paris, Frankfurt, Philadelphia. After meeting, we had changed our previous plan due to certain situation. We went to house where he used to share along with 3 other people. I had a small introdution talk with Neil and Andrias who is serving for a Nearby Church. Then we baught some snacks for munch and went to the Information centre. We baught 3 days tour pass costing 57 Euros. It's including Travel in Train, Bus and Entry fees for most of the tourist places. We first went to Copenhagen zoo. It took 4 hrs. to explore the zoo as well the surrounding area. While exploring we had a small discussion about space utilisation and the way all these animal kept here as compare with India. The Zoo has funniest children's zoo in Europe. Later had some food and went to the house for dinner. After dinner went to Copenhagen City Center for night view. There are many refugees housed in the Copenhagen from various coutries like Bangladesh, Pakistan etc. We went to Frederiksborg Palace/Museum. It was built in 1600 by Frederik II and Christian IV. Frederiksborg is Denmarks's largest portrait gallery, with pictures of all Danish monarchs since 1500 as well hundreds of prominent Danish men and women. Then went to Canal tour by boat. For us it was free of cost due to our boat guide was sister of Andrias. It was quite refreshing one passing through the Danish Colonies. It was like passing through brief history of Denmark. Then went to a Thorvaldsens Museum. The Danish sculptor Bertel Thorvaldsen (1770-1844) lived more than 40 years in Rome ans was one of the most renowned artist among his contemporaries. Then return back to home had dinner and again went out for night scenes in the city. We went to Viking Ship Museum. It has Viking ships from around the year 1000. While on the way visited Roskilde Domkirke, Sepulchral chapel of Danish Kings and queens. A splendid illustration of Danish architechture and history of the past 800 years. Then visited Denmark aquarium. One of the Europe's largest and most beautiful Aquaria with fish and other aquatic animals from the whole world. While returning by bus, Sandesh had a chat with a Danish old Lady and found that these people too like our(Hindu) culture. She express her disliking about the other minorities staying in Denmark by some or other means. She happily waved a bye bye to us which remind my return jouney too. There are so many places to visit but not possible to complete in 3 days. So we returned to City centre for the return journey. The return flight was at 7:10pm from Copenhagen. I was at home at Frankfurt by 9:30pm. Photo Link will be replaced soon..